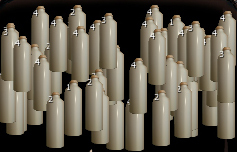 Today i wanna show a small analysis of the most discussed topic ever in Entropia Universe. First i give you a roughly estimation about the daily demand in the entropian economy. 1. Mind Essence: daily sales on auction is around 2000 Ped TT. by 10 ped TT on 1 k sweat gives this a daily demand of 200 k Sweat / day just for Mind Essence. 2. Welding Wire : Daily sales on auction are 500-600 ped TT. The tricky thing is , it is ways more traded out of the auction, which is not listed in maket detail information. I know people they selling this amount sometimes per day single in private trades. This is the reason why i double the amount of welding wire sales / day on base of a stable level. On Welding wire we have aswell on 10 ped TT on 1k sweat roughly. This does 100k sweat daily demand. 3. Minor uses: Mind Ark introduced in the last year plenty of new uses for Vibrant Sweat. Arkadian Golden key (needs 50k/click), Pergola (Arkadia, 10k/click) and many more……..
the point on this minor uses is , that there is no high demand, means the crafters cant sell the items to get back their MU they payed for the sweat. So they are not crafted every day or even in large batches. In the end is in cause of the high spread of possible uses, still a high demand , but almost not able to check. This items not selling often on auction and some items are crafted for the TT-machine. I guess a deamand for all “minor uses” together, on base for a stable level, to 200k /day. Thats a daily demand of 500 k sweat in summary. But for all that advantages the sweat got on significance for the entropian economy, the sweat price still decreasing badly. In febuary 2012 the sweat price was 2.2 – 2.5 ped / k .
nowadays the sweat price is 1.6 – 1.8 ped /k . Seome people still think, they could sell it in large amounts for 2 ped/k or more but thats mostly a dream. No crafter is willing or often able to pay more then sweat is worth on the open market, because they have to sell the materials or items they craft for a competitive MarkUp. This is what sweat sellers forget or often just dont know because they never crafted anything themselves in larger batches. The sweat prices are in average down to 1.7ped / k , anyways if its Rocktropia,Arkadia or Calypso. Some people still think Mind Ark need to do more to make sweat more and more and more significant. But in the end other people need to pay this and there is no reason to blow up the MarkUp’s for the depositing players more then necessary. Mind Ark did really a great job to introduce more uses for sweat in Entropia Universe, but there is just no demand for expensive things. We all looking for the cheapest and most economic way to play 😉 !! For the supply of sweat i use a simple mathematic calculation. Im not interested to get the exact daily production of sweat and this is almost not possible for me, only Mind Ark could get a reliable information about this. if 250 sweaters[S] just creating 2k/day[P] it is stable, but if there is a small leak in the demand the market is already over supplied. Price for sweat = MU (MU0 is the current worth // MU1 is the worth compared to MU0 after Time “x” in : y ( x ) . I know the sweatcamps in the universe. Im pretty sure that D < S*P . We have definately more then 250 sweater which produce more then 2k each per day……………….. The other thing is that people forget that there is a large heap of sweat stored in any storages of players. The top bottom is not reached yet.